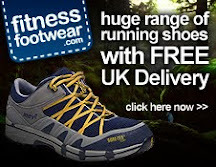 One of the highlights of the past week was receiving an e-mail from Adam Smith of Fitness Footwear (www.fitnessfootwear.com) who offered me a free pair of Salomon XT-wing trainers in exchange for a web-site plug and shoe review. Now I’m not too proud to accept a freebie, as everything helps and I have been planning to get some more off-road shoes (especially having swamped my last pair in the Steppingly run). Hopefully I should get these this week and will give them a thorough testing with the aim to use them in the Gatliff Marathon at the end of the month (provided they wear in well). Will keep you posted – watch this space. 8th Steppingly Step – Wet and boggy – great!! !